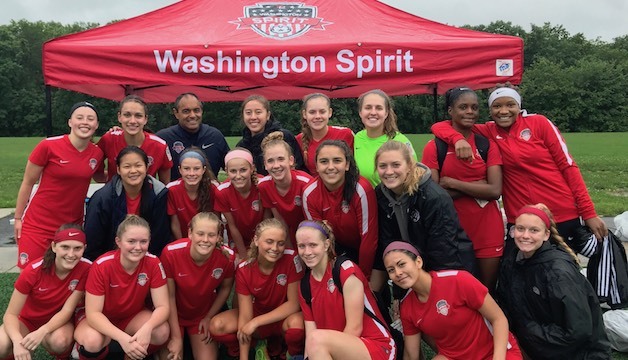 Boyds, MD (June 13, 2018) – The Washington Spirit Academy – Virginia U-16/17 team has qualified for the U.S. Soccer Girls’ Development Academy Playoffs in the league’s inaugural season. The Virginia U-16/17 academy team finished the 2017-2018 regular season with a 19-8-4 record, accumulating 61 points in 31 games. They earned second wildcard position in the playoff standings, coming out of the Atlantic Division in the East U-16/17 Conference. “It’s quite an accomplishment for a first-year club as well as a first-year to team to reach the final competition phase of the season,” said head coach and Spirit Academy – Virginia Director Tom Torres. “We’re excited about the work that all of our teams and staff did this year, but to have a team reach the postseason is exciting. It was a full team effort that has led the Washington Spirit Academy – Virginia U-16/17 team to the postseason. It also could not have been accomplished without a club-wide effort on-and-off the field throughout the season. On the back line, defenders Elizabeth Ammon and Peyton Nassetta, Riley McCarthy and goalkeeper Riley Melendez each played key roles for a deep and effective defensive unit. The team held opponents to less than a goal per game, conceding only 29 times in 31 regular season games. On the offensive side, Jasmine Hamid, Jada Konte, Hailey McGregor and Gabrielle Robinson played a big role that contributed to the team’s 61 goals this season. Konte led the team in scoring with 19 goals in 27 games played. Hamid is third on the team in goals with eight tallies in 30 games. Robinson has scored six goals in 30 games, and McGregor has recorded two goals in 28 games, while also serving as an invaluable playmaker in the passing game. Lauren Teuschl and Caitlin Sutton also played a huge role by providing good connections to teammates in the midfield and key scoring opportunities. Teuschl netted 13 goals on the season, and was the only player on the team to start all 31 games. The Spirit Academy – Virginia U-16/17 team will play at the SoCal Sports Complex in Oceanside, California from June 18-30. The event will host both the Boys’ and Girls’ Summer Showcase, the Development Academy Playoffs, the Quarter-final Knockout Round and the Girls U-18/19 National Championship.